In the center of the Democratic Republic of Congo, the Unia River flows around a circular structure known as the Wembo-Nyama feature. 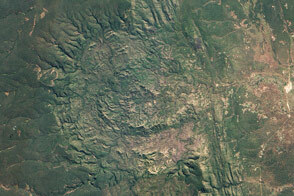 Several things in nature leave a circular footprint such as this, including volcanoes and uplifted domes. However, Italian scientists from the University of Padova believe that the Wembo-Nyama feature is an impact crater. If the 36–46-kilometer-wide feature is a crater, it is among the largest in the world. 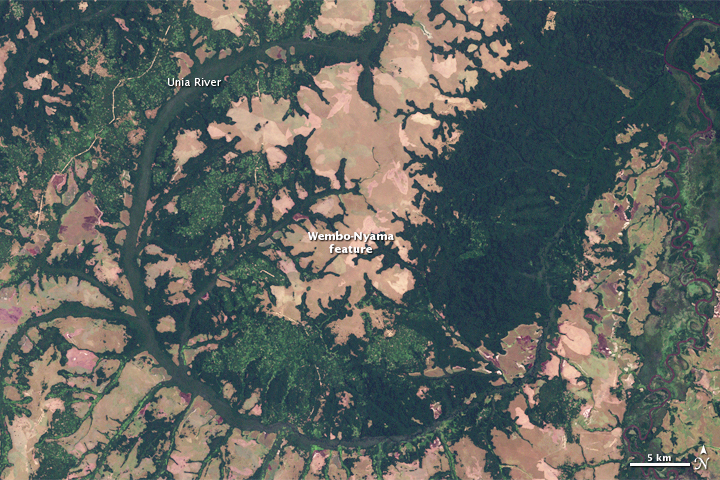 The river’s path highlights the circular structure in this natural-color image acquired by the Landsat-7 satellite on April 1, 2000. Fingers of deep green forest extend from the river, probably along tributaries that drain the elevated structure. In places, the forest has been replaced with spots of bright green farm land. The land that isn’t forested or farmed is tan, an indication that little is growing. The drainage pattern exhibited in this image is typical of craters in tropical regions, the University of Padova scientists told BBC News. The river flows through a depression, while the center of the circle is elevated. When a meteor strikes Earth, it creates an explosion that compresses the rock in a circular region. In deep, large craters, the rock in the center rebounds, creating a dome of uplifted rock. Scientists have to sample the rock in the Wembo-Nyama feature to confirm whether or not it is an impact crater and when it formed. Its size suggests that, if the structure is an impact crater, it was created by a meteor measuring about two kilometers across. NASA images by Robert Simmon, based on Landsat 7 data. Caption by Holli Riebeek. 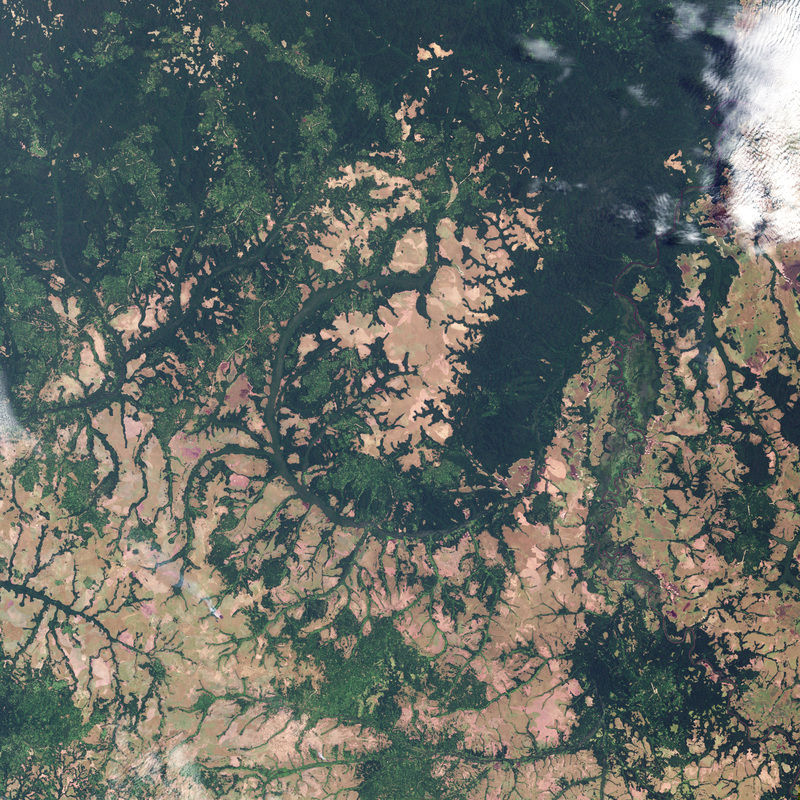 The dark green Unia River highlights the circular structure of the Wembo-Nyama feature—a possible impact crater in the Democratic Republic of Congo—in this natural-color image from April 1, 2000. Planetary Science Institute. The explorer’s guide to impact craters. Accessed March 26, 2010. Rincon, P. (2010, March 10). DR Congo ring may be giant ‘impact crater.” BBC News. Accessed March 26, 2010. Wikipedia. (2010, March 22). Impact crater. Accessed March 26, 2010.